Well, all right, that’s that. No alternatives. Official science is the only science. But oops; all along, there have been dissenters from the manmade warming mantra; they just haven’t been allowed inside government and media portals. One of the major warming hustlers is, of course, Al Gore. Every movement needs such men. In 2001, Al was worth less than $2 million. By 2012, it was estimated he’d locked up a nice neat $100 million. How did he do it? Well, he invested in 14 green companies, who inhaled—via loans, grants and tax relief—somewhere in the neighborhood of $2.5 billion from the federal government to go greener. Therefore, Gore’s investments paid off, because the federal government was providing massive cash backup to those companies. It’s nice to have friends in high places. For example, Gore’s investment firm at one point held 4.2 million shares of an outfit called Iberdrola Renovables, which was building 20 wind farms across the United States. Iberdrola was blessed with $1.5 billion from the Federal government for the work which, by its own admission, saved its corporate financial bacon. Every little bit helps. Then there was a company called Johnson Controls. It made batteries, including those for electric cars. Gore’s investment company, Generation Investment Management (GIM), doubled its holdings in Johnson Controls in 2008, when shares cost as little $9 a share. GIM and Gore sold when shares cost $21 to $26—before the market for electric-car batteries fell on its head. For a while, the going was good. To make it go good, Johnson Controls had been bolstered by $299 million dropped at its doorstep by the administration of President Barack Obama. On the side, Gore had been giving speeches on the end of life as we know it on planet Earth, for as much as $175,000 a pop. (Gore was constantly on the move from conference to conference, spewing jet fumes in his wake.) Those lecture fees can add up. So Gore, as of 2012, had $100 million. The man has worked every angle to parlay fear of global-warming catastrophes into a humdinger of a personal fortune. And he didn’t achieve his new status in the free market. The federal government has been helping out with major, major bucks. This wasn’t an entrepreneur relying exclusively on his own smarts and hard work. Far from it. —How many scientists and other PhDs have been just saying no to the theory of manmade global warming? 2012: A letter to The Wall Street Journal signed by 16 scientists said no (see here and here). Among the luminaries: William Happer, professor of physics at Princeton University; Richard Lindzen, professor of atmospheric sciences at Massachusetts Institute of Technology; William Kininmonth, former head of climate research at the Australian Bureau of Meteorology. And then there was the Global Warming Petition Project, or the Oregon Petition, that said no. According to Petitionproject.org, the petition has the signatures of “31,487 American scientists,” of which 9,029 stated they had Ph.Ds. This is the long-term goal. This is the Globalists’ Holy Grail. To learn more about this big con and swindle, I encourage you to read the book “Technocracy Rising: The Trojan Horse of Global Transformation”, by Patrick Wood. That’s a beauty, isn’t it? The US, with its massive spewing industrial/automotive output of CO2 is—owing to a mysterious force—not warming. Why not? It’s angels, of course. Angels scrubbing the sky. But I suppose, through a REVERSE miracle, the droplets do allow heat generated at ground level to escape upward. If the droplets did trap heat at ground level, temperatures would rise—and the study showed the rise wasn’t occurring. More angels. The magic droplets deflect heat coming down, but not going up. But don’t worry, be happy. It’s all good. Yes, the warming hypothesis leads to carbon taxes, lowering energy output in order to keep us all from frying, and the consequent decimation of the economy—but look, people make mistakes. However, they mean well. They really do. And that’s what counts. THEY’RE NOT USING A BOGUS WARMING HYPOTHESIS TO TORPEDO AMERICA AND THE REST OF THE WORLD, AS PART OF A GLOBALIST MACHINATION OF CONTROL. THEY DON’T WANT TO DECIMATE THE ECONOMY AND REDUCE US TO A HELPLESS STATE OF POVERTY. This entry was posted in Global Warming, Press Fraud, Science Fraud. Such a dangerous meme, that science is about consensus-building! It is tied in to the over-arching meme of UNITY in all things, enforced unity, pretended unity, which is by definition fascism. Do we even remember where the word fascism comes from? It is derived from the Italian word “fascismo” and the related Latin “fascis” which means a bundle of rods. Not a collection of rods, but tied together, being forced together, forced UNITY. That’s fascism. But the word is currently used to mean its opposite – daring to be different, to oppose the consensus. Trump is called a fascist precisely because he would divide the false consensus. That’s considered dangerous, reckless. Hey! This is liberty! You know, there is another name for a “bundle of sticks” besides fasci. Massive earth changes are taking place at this time. There exists a “huge media blackout regarding supermoons, orbital and axis changes, quakes and tsunami”. Net search that sentence in quotations and you’ll find iron clad proof that our planet, and indeed our solar system is undergoing great change. The video alone says it all. Quite a few years ago I watched Al Gore’s movie, but it was so full of holes that halfway I turned it off, as I started to fall asleep. The stories haven’t improved since. The IPCC itself announced a year ago that the earth is cooling down, but they quickly added that “this is just a pause in the warming process”. Obviously they have psychic abilities there. I found it hilarious how they tried to prove themselves right when they first admitted they were wrong. Let’s face it: every time climate scientists (who fully depend on climate change for their jobs) predicted warming it didn’t happen. So far they have been incorrect 100% of the time. These people live in Lalaland and their stay is generously funded by the tax payers. We don’t need anyone to tell us that extreme weather is happening all over the planet. We see it every week or month on the news: tsunamis, floods, bug infestations, melting icecaps, rising temperatures as well as snow in places that never got it before. Al Gore’s CO2 studies are very compelling. The fact that he has profited from the need for alternative energy sources doesn’t mean it’s all a hoax. Anyone with an eye on trends could see that this was an area of demand that would increase. I love your opening line, “We don’t need anyone to tell us …” Which means, we know what we know already, without any analysis. Exactly what they want to the public to do! Just give in to the imagery of the nightly news. Which, surprise, is exactly what you advocated in your comment! A scientific study has to be more than “compelling.” Whatever that means. Maybe it is an apt word, since they want to compel us to accept their claims despite their fraudulent data (no question there) and their spectacularly failed predictions. Anyone with an eye on trends (again, the nightly news) but not on actual results of alternative energy, of course would fail to see the hoax of the climate scam. Sister, you’re not ready for a real discussion yet with people who actually think. Global warming causes Tsunamis, I wondered how that happened. Bugs are taking advantage of global warming…little bastards. I did’nt know Nuns were in the climate business. Did pope franny diversify…he’s a smart guy. And the ice caps melting…well I have talked too Tim Hortens about their ice caps, and they say that global warming isn’t causing their ice caps to melt…it’s the heat from peoples hands, holding on to it too long, there ya go. One problem solved. Al’s got a new movie out; have you seen it? Part two, revenge of the Global warming. I think it’s going to be a trilogy…whadja think sisters. So..I got a nun joke. Wanna hear it? Q: How do you get a nun pregnant? A: Dress her up as an altar boy. Hahahahaha…The priest that comes to my jam sessions told me that…too funny. His singing is crap but he plays a mean bass guitar. The article linked above is pretty good. I had read it a few months ago. And even the glaciers are part of “The Great Conspiracy”. Must have taken hours of Photoshop time. 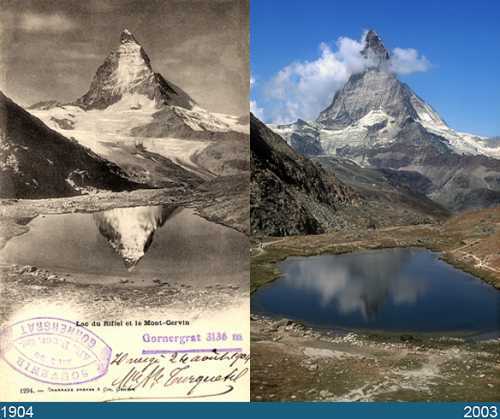 Even the famous Matterhorn is part of “The Great Conspiracy”. Claims about rising sea level are also part of “The Great Conspiracy”. Look at what happens when somebody left their hose on and then “The Great Conspiracy” attributed it to Global Warming. P.S. Here’s a hint. The real world is not interested in Global Warming Deniers’ fabricated conspiracies and/or their paranoia. ICE MELTS! !…I thought glacial ice was special. I had a martini once shaken over glacial ice, cost me $15 at the Banff Hotel. I think it tasted different. It definitely tasted old. I got an idea…how about we get all the people from BLM to lay side by side on the glaciers; like little black snow angels…to act as a albedo, sucking up all that evil sunlight and infrared, protecting the precious ice below it …whadja think Bill. Sorta like two protests in one. Oh yeah we could get the scientist on the march to lay down beside them and spread out their white lab coats; that would reflect some sunlight back, eh bill. Sometimes I get great ideas…Jon’s imagination exercises are really helping me. I like the colored pictures better William. There’s trees growing now and the lake is such a nice emerald green…reminds me of Ireland in the springtime. Ya ever been to Ireland Bill…they don’t have glaciers, they ate em all during the famine. Is that deer at the edge of Lake Muir. Boy they look a lot better now, looks like there is lots of grass and shrubs now, their not as skinny…much, much better. Btw are there fish in that lake Muir? Its probably a brand new lake, the fish arn’t thawed out yet. Cause I like fishing Bill. Do you know if they are selling (probably leasing) any nice lake lots, around that lake, for a reasonable price. Were is that by the way; is that ah, in Canada, or Alaska? I could just see me and the little squeeze kayaking round the beautiful emerald green lake. Muffin talkin to me about her crochet patterns; me with my headphones on listening to Jon’s “Exit from the Matrix”. Stop for a little break, spark up a bomber, a little sip of that 12 year old Jameson I have in my little flask. Blow muffin a kiss, paddle on. Maybe stop have a picnic lunch, test out the new sleeping bag. Yeah, that a nice dream. Listen, write me back about the lake properties Billy boy ASAP. …me and the squeeze are waitin. Hey Mike as a resident of northern Canada since the early 70’s I’ve seen with my own eyes the undeniable fact that glaciers up here are in retreat. 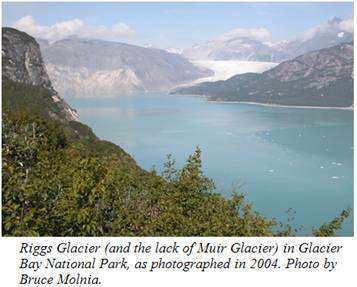 Just look up some info on the Mendehall Glacier in Juneau AK for a dramatic example. I think the changes here are far more dramatic than those down south. 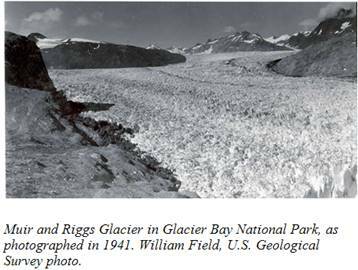 The only way glaciers will melt is that it’s warmer now on average than when they were forming. It’s the same story all across the northern hemisphere. There’s no denying average temperatures have risen in the north. The only room for debate is why. I’m sure I’m wasting my time trying reason with someone who obviously is much wiser than myself. All the best to you and muffin. “The only way glaciers will melt is that it’s warmer now on average…” I can also change state, that is from solid to water vapor. Check it out in text books. How much is melt or sublimation, not sure. I have seen snow slowly disappear in the yard not due to temperature rise. It seems this explanation is not so easy. Jon, as you are aware “global warming/climate change” is a monstrous misdirection campaign and I am glad you hinted at industrial pollution being the cause. We know industrial pollution CAUSES cancer. In light of some rather uncomfortable discussions on the subject on another of your articles’ comments sections, I have decided to pen a new post “Coming Clean on Cancer” at https://ozziethinker.wordpress.com. I may as well cover “fluorides” (sic), vaccines and “global warming” too. There is another deception (hammered out by Dabid Icke, of “all” people). You see, they rely on climate records roughly 100 years old, although data 60 years prior was sufficient for survey purposes. It gets worse. In fact records on climate are “relatively good” (depending on which part of the world is being considered) for the last 800 years and even the Romans (pre 2000 years) kept records that might be translated into something meaningful (they did scientifically aggregate sun day). Why are “they” “obfuscating” all those records going back 1000’s of years? Well, there have been NO major solar temperature fluctuations and “science” would struggle to justify the Arctic/Antarctic ice fields as “natural”, if they took the records seriously. Indeed, GOD FORBID, those potty “drug induced” ancient text (Vedas and others) that talk of moons colliding with Earth, might offer the only, ARGHHHHH, logical explanation for the ice! For instance, perfectly preserved mammoths have been dug up not only with undigested food in their stomachs, but one was still chewing berries as he was “snap frozen”. Ah Birdseye! Physicist James Mccanney has designed a new type of wind generator, that is almost a complete departure from the highly inefficient 3-blade systems: the Mccanney Wing Generator. The Wings are scalable, from single family size all the way up to city-sized. An engineering firm has calculated that a 1000-foot diameter Wing would generate the equivalent of two 500-megawatt coal-fired power plants at ONE-PERCENT of the construction cost and at peak efficiencies (28-35mph) something in the neighborhood of 2.0 3.7 GIGAWATTS of energy: that’s 2 billion to 3.7 BILLION WATTS OF ELECTRICITY…..and every single watt pollution-free. All maintenance would be done at ground level and as an added bonus there would be little-to-no avian kill thanks to the unique design. The cost of energy would drop precipitously as the only expense after construction would be that of maintenance. Lower energy costs would be expressed across the board n transport, manufacturing, heating/cooling, etc. freeing the populace from overwork and concerns about mercury in our fish and radiation in our bodies. Mr. Butler, it’s called climate. The world goes somewhat cooler then somewhat warmer. Been happening since the continents formed. Mankind is completely unable to instigate global climate change in any sustainable way aside from a nuclear winter, and even that is theoretical. Yes glaciers in the northern hemisphere are pulling back. Glaciers in the southern hemisphere are growing. We haven’t had a major hurricane hit the US in many many years. At some point one will hit the US and you will scream that’s proof of your theory since it hasn’t happened in about 10 years. Why not include earthquakes? They happen too – and wouldn’t it be a shame to waste a good disaster? Surely your ilk can some day find an imaginary connection between my Hummer and an 8.0 earthquake someplace. How can scientists take a stand for science in politics when there is a separation of church and state? Nah who told you that? I thought is was “In God we Trust”. It’s right there on the back of the very holy one dollar bill. There has never been a political system that was free from a church, religion or any spiritual endeavour. Even the athiest Soviet Union was the hybrid of the religions of Karl Marx and Vladimir Lenin, the prophets of socialism and communism. Politicized science is the new religion of global government. Even the catholic church has taken 500 years and acquiested to scientism. Their future lies with sciencism, or the abyss of obsolescence. Science has been used moreso to prove the church. It is so revealing that these people have no regard for facts, only their theories, which have been proven wrong many times. It’s like so many other things in this world, it’s all about the money and power, don’t worry about facts, if they lie about it often enough, sheeple will believe it. The scientists can’t even agree if it’s global warming or climate change or global cooling. According to the climate warming projection many countries were supposed to be underwater by now. So they changed their meme to climate change. Bad news is that climate always changes. Remember the ice age? The truth is climate change scam is about passing a global tax on everyone just like Canada has just done. Like taxing people are going to stop climate change. Seriously who believes this stuff. Here in Oz (probably the same elsewhere) the media is complicit in these lies and anyone who dares question the ”scientists agree” meme is ridiculed and virtually written off as a nutjob. Nowhere is there any sensible discussion of alternative thought. How dare some neanderthal caveman think it ok to go against the mainstream brainwashing?! There is NO Carbon climate forcing, NO sustainable energy and NO peak oil, the trifecta of elitist lies. No gas molecule can capture, store, redirect or amplify radiant energy. But the Alarmist BIG and Luke Little debate is fake, directed narrative. Ok call me stupid but someone please spell this out for me…. I think you all should spell this out more wherever you go, so that people who support climate change will understand you, because if I don’t, they sure don’t.